A beginner’s Bach library will contain the Cello Suites (BWV 1007-1012). If you continue to “Bach 102”, you will see the Sonatas & Partitas for Solo Violin (BWV 1001-1006) added. Among the non-keyboard instrumental music, those are the staples - and everyone has their favourites. Mine, since I can pretend you asked, are Pierre Fournier (DG), Jean-Guihen Queyras (Harmonia Mundi), and Peter Wispelwey II (Channel) for the Suites and Nathan Milstein II (DG), Rachel Podger (Channel), and Viktoria Mullova (Onyx) for the Sonatas & Partitas. Only a few steps later will the Sonatas for Violin and Harpsichord (BWV 1014-1019) and the Sonatas for Viola da Gamba and Harpsichord (BWV 1027-29) enter the picture. Or the Lute works - which aren’t for lute, actually, but let’s ignore that for now. Beyond that, we get into rarified territory, which is surprising that any such should still exist in as safely grazed-over a composer as Bach. In fac there are more chamber works in his output than the abovementioned, and this disc presents five of them … from second-tier popularity (BWV 1020) to absolute rarity (BWV 1022). Part of the problem for these works yonder the popular divide is that it’s not clear when they were written, or what instruments they should be played on, or even who wrote them. Why and when that actually contributes to obscurity is hard to say, also. Certainly any legitimate doubts as to the Cello Suites and their specifically intended instrument - never mind the perennial inscrutability of the Art of the Fugue - haven’t kept these pieces from being recorded dozens, hundreds of times. Even so, for one reason or another, some works fall through the cracks, even with Bach; some are picked up by some instrumentalists, but not others. Flautists for example, a very repertoire-eager breed of musician, have tackled every Bach piece that could even just conceivably be suited to the flute, and recorded it … apocryphal attribution or not. The problem with the flute sonatas - of which BWV 1020 was eventually deemed not by Bach (not Johann Sebastian, anyway) but now is considered Echt-Bach after all, and two more (BWV 1031 and 1033) probably, possibly not by Bach - is that they’re usually rather boring on the flute and only a little more interesting on the recorder; but still no greatest hits. This makes it so intriguing to hear these five works on this disc - the Sonatas for Violin and Basso Continuo BWV 1021 and 1023, the Sonata for Violin and Harpsichord BWV 1022, and the Sonata for Recorder and Basso Continuo BWV 1033 (otherwise found together only on Reinhard Goebel and Musica Antiqua Cologne’s 8 disc set of the complete chamber music on Archiv): They’re not played on the flute, but as the violin sonatas which at least some of them were intended to be and, equally important, the keyboard and continuo parts are given to the guitar, something that already worked wonders for Marina Piccinini’s release of the Flute Sonatas where João Luiz and Douglas Lora inject a unique liveliness into the music. 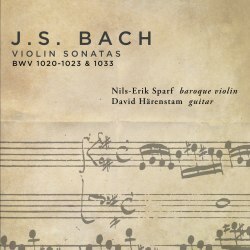 Nils-Erik Sparf performs on a baroque violin and David Härenstam on the guitar, which is a curious mix of the historically informed and the historically blithely indifferent, since the guitar is very little like anything that Bach would actually have had in mind. Musically it works beautifully - after Härenstam tuned down to meet Sparf’s historical pitch; when going the other way turned out to be unsatisfactory - and that’s what the two are after: Beauty and musicality in the service of Bach and the listener, not musicology. For the same reason they recorded these sonatas live in the studio, whole movements in one take. Indeed, free flowing and improvised, sparkling with wit and invention, the question about Bach-or-Not never arises while listening to these sonatas. The tenacity of Sparf melds perfectly with Härenstam’s mellow, but keenly accentuated lines - at once an alien and a timeless fit in this Bach-combination. BWV 1020, which has seen action in all kinds of imaginable combinations on record (despite the sketchy provenance) - mostly flute with piano, fortepiano, harpsichord, claviorgan, or clavichord but also recorder (or traverso) with harpsichord. Ditto oboe and harpsichord, harp, or organ. Violin and harpsichord. Violin with harp. Violin, Viola da gamba, and fortepiano. Pan Flute with Accordion. Viola and Piano. Mandolin and Guitar. Harmonica and Accordion - this, a recording by Joe Sakimoto and Mie Miki, I must get - and solo euphonium - sounds here like resurrected and at home at last. On the other hand, even the greatest enthusiasm doesn’t turn the opening movement of BWV 1033 into one of Bach’s greatest hits. All the same, this is so much more than just a convenient stopgap for the missing BWV numbers in your aspiring Bach collection … it’s a superb Bach release in its own right.